PCS-Electronics :: View topic - Blew out final, no SWR, confused. Blew out final, no SWR, confused. I attached the MAXPRO5015 to a 800W amplifier. The amplifier needs about 5-6W for full power. I tested the amp before with a low quality Chinese transmitter into a dummy load just to see that it was working. I first tested the MAXPRO on it's own into the dummy load and it seemed to work fine up to the full 15W. I left it on for about 20 minutes to verify it wasn't overheating. It reached about 40C (I used a huge heatsink). I then hooked it up to the 800W amp into dummy load and began with the power set to 1W. Everything was fine and the amp put out about 250W. I slowly started to increase the power on the MAXPRO (with the jumper set to the 8W limit). As I was increasing the power, the LCD started to act strange. It began selecting random settings from me just touching the knob (no pushing or turning). I got it up to about 5W with no SWR and the transistor started smoking for a second, then the fuse blew. I have no idea what I did wrong. I hope nothing else is damaged. I know I can probably order a new transistor, but I don't know how to prevent this. Any help? Please send some photos to our e-mail (you can reply to order confirmation). Any of these can cause catastrophic failure. For example, more than 16V can damage exciter. Also, if microcontroller goes crazy it can set frequency to say 120MHz causing the final to experience bad swr from filter. Especially make sure the +48V going from the 800W amp is properly decoupled, such as with feed-through capacitor installed into the wall that separates RF amp section from the exciter. This power line usually carries the greatest amounts of RF into the rest of the setup. Photos will really help identify problem areas, please email a couple. I will send some photos as soon as I can. I did notice the 12V supply would increase to 15V when powering the amplifier. When I built a 150W transmitter I didn't have these problems. I didn't realize I have to isolate the amplifier power from the exciter in some way. I thought I knew what I was doing. Right now the setup is very simple: one 12V 10A power supply and one 48V 32A supply both wired directly to the exciter and amplifier. Yes, as the power goes up things get messier and you can't get away without paying attention to RF shielding and especially decoupling power lines. I will point out the weak spots and recommend a fix once I get the photos. I've been busy for a while. I am updating to let you know I sent the photos. 1. Output connector wired in a "funky" way. I can't stress enough how short lead length is critical at high frequencies and high power. In this particular example you had central coax conductor soldered directly to the central pin of the connector, BUT the ground lead was wired with a wire loop about 2cm long. This is A LOT. A few millimetres would have been acceptable at this power level. It is very hard to do this well with a regular connector, you could try by wiring coax from the side and using lots of wires for the ground, but it is a messy job and not professional at all. With these connectors the ground is all around the coax shield making a perfect low induction connection, the ground is also shielding the central conductor so there is very little radiation. Looks much better, too. The coaxial cable you used is teflon which is good (RG142 and similar), this is necessary since you are supposed to solder ground directly to the pallet ground. Semi-flexible 50 ohm (1000W FM) - per foot is perfect, no isolation to remove, you can solder it as it is. Something I forgot to mention in the email was the feed through caps. What would you recommend using for that? If you can't get the real deal you can improvize by using a small RF connector, such as SMA, than put lots of ceramic caps from center (where you will route 48V) to ground with as short leads as possible. Caps such as 100pF and 1nF, ceramic type, able to handle 50V or more. You can also use BNC. 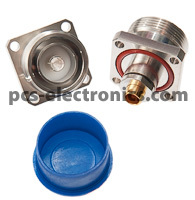 Or buy the real feed-through caps, observe current / voltage rating, 1nF is usually fine. This is a type you can use up to 20A, if your amp uses more than use 2 -3 in parallel. Definitely use these for +48V or whatever supply voltage to the amp is. They are also recommended for other signals (SWR, PWR and bias disable). I forgot to mention in my email, but I figured out why there was "no SWR" and still managed to burn the transistor. There was a defective surface mount resistor or capacitor that was soldered at a slight angle so it was only making contact with one side. After resoldering the transistor, I fixed this as well and now have SWR measurement working correctly. The noise floor is still a problem though.